Last night I was helping the Squid with her homework. She had to draw children playing so she decided to give me a lesson on how to draw a stick figure. I had no idea! lol. The Squid helped me out and made sure the legs and arms were right. She informed me that the head went on top (again, I had no idea!). 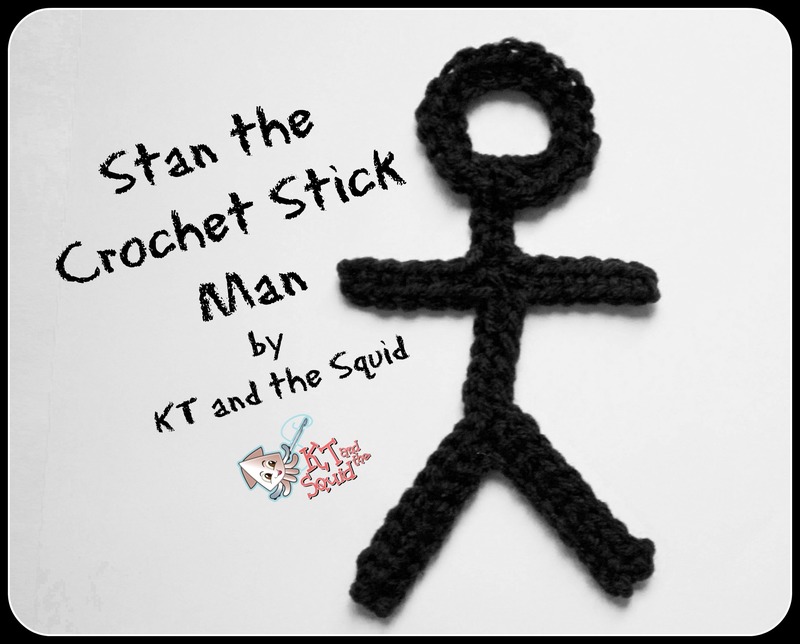 Here you have (Squid approved) Stan the Crochet Stick Man! If you’d like to sell finished items from this pattern please do! Finished items belong to you and you may do what you wish with them. If you choose to sell them on Etsy please credit me (KT and the Squid) as the designer and add a link to my shop (www.ktandthesquid.etsy.com). All KT and the Squid patterns are tested by wonderful volunteers. Stan is worked in one piece. You’ll start at the legs, work your way up his torso, one arm, the neck and head and then back down. When working in the chs work in the back hump for a uniform look. Legs – Ch 18, sc in the 2nd ch from hook, sc in the next 7, 3 sc in the next ch, sc in the last 8, ch 1, turn, skip 1 st, ss in the next 9. Torso and 1st Arm – Ch 12, sc in the 2nd ch from hook, sc in the next 5. Neck and Head – Ch 18, join with a ss to the 14 th ch from hook. Head – Ch 1, continue working around the ring formed to make the head, (sc in the next ch, 2 sc in the next ch) 7 times, join with a ss to the 1st sc of this ring. Neck – Sc in the next 4 chs down the neck. 2nd Arm – Ch 6, sc in the 2nd ch from hook, sc in the next 4, sc in the side of the last sc of the neck. Torso – Sc in the next 5 chs down the torso. Leg – Ss in the same st at the top of the legs, ss in the next 9, fasten off, weave in ends. When you’re done Stan will be a bit curly. You can fix this by blocking. Since I used acrylic I just pinned him to my ironing board and hit him with some steam from an iron. Do NOT touch him with the iron or he’ll melt! I hope you enjoy Stan. I think he’d be cute sewn onto a sweater. You can starch him, put a magnet on his back and put him on the fridge. Or make a whole stick figure family!